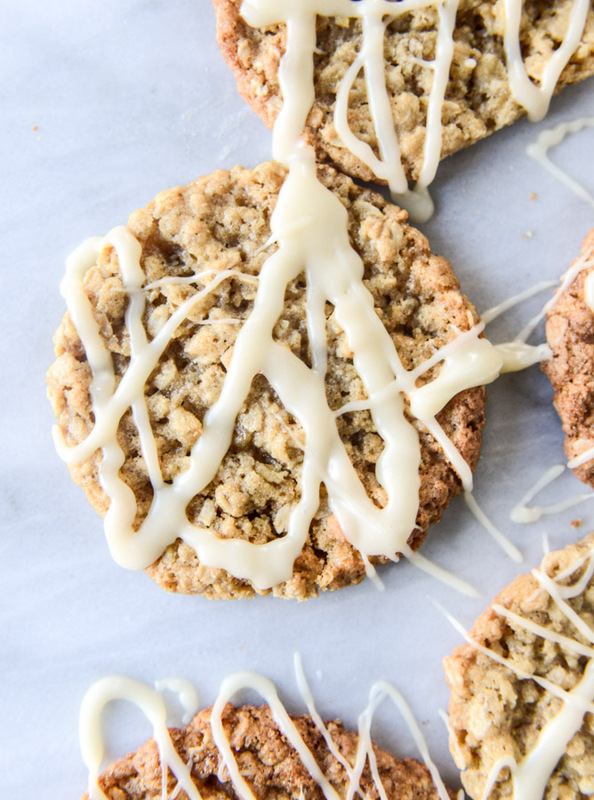 These delightful oatmeal cookies are chewy, chewy, chewy and drizzled with brown butter icing. Love is in the air!. Preheat the oven to 350 degrees F. Line a baking sheet (or 2) with parchment paper. Place half of the oats in a food processor and pulse until the oats are chopped up, some flour-like, but some pieces remaining. In a bowl, combine all of the oats, flour, baking soda, cinnamon, cardamom, nutmeg and salt. Whisk together. In a large bowl, whisk together the melted butter and brown sugar until smooth. Whisk in the egg and egg yolk, then the vanilla, until smooth and combined. Take a large spoon and stir in the dry ingredients, mixing until a dough forms. Scoop the dough out using an ice cream scoop (you want about 2 tablespoons of dough) and place on the parchment paper 2 inches apart. I put 6 on a baking sheet - because they will spread! Bake for 12 to 14 minutes, or until golden on the edges and thin and chewy. Remove and let cool completely. Heat a small saucepan over medium-low heat and add butter. Whisk constantly until melted, then continue to whisk as bubbles form, the butter begins to foam, and eventually brown bits appear in the bottom of the pan. This will take about 5-6 minutes total. As soon as the brown bits appear, remove from heat. I always stir for an additional 30 seconds or so. Let cool for 10 minutes. Note: if you refrigerate this dough for an hour or so before baking, they won't be QUITE as thin! In a large bowl combine brown butter, vanilla extract and powdered sugar. Whisk until the mixture comes together then add in 1 tablespoon of milk, continuing to mix. I always stir my glazes for a good 3-4 minutes so they really come together. If it still doesn’t appear glaze-like, add in milk 1/2 tablespoon at a time and mix again. Don’t worry if it becomes too liquidy – just add a tiny bit of powdered sugar until you get the desired consistency. Drizzle the glaze over the cooled cookies.